Book 2 of the Gwen Sparks series has been released and it is a doozy! If you like a little steamy PNR do yourself a favor and read both of these fantastic books. Stephanie was nice enough to stop by today with a little excerpt for you. 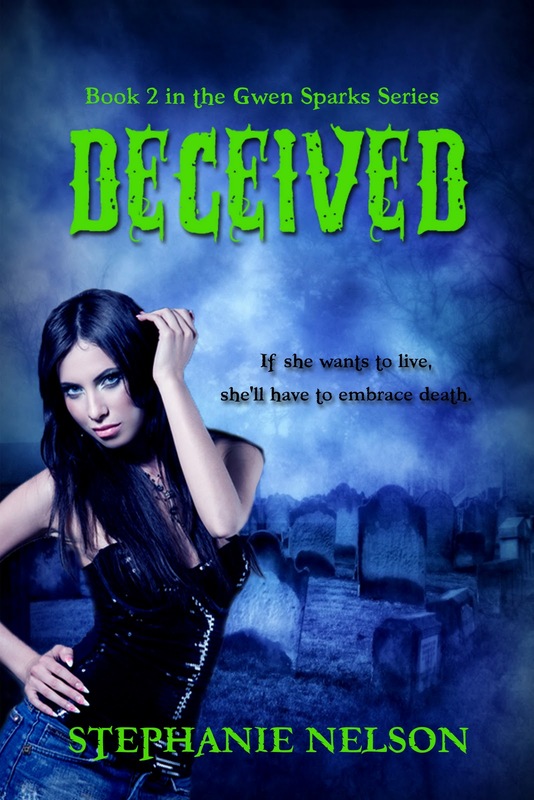 Blurb: Gwen’s life has been a downward spiral since she discovered vampires crave witches blood. She’s summoned to Moon, the town of witches, where she learns that a war is brewing and she’s the secret weapon. Paired with the Angel of Death, it becomes quickly evident that she’s more powerful than she ever realized. But this reaper isn't the robe wearing, scythe carrying kind – he’s a ruggedly handsome handful that has his eye on Gwen. As if that isn’t enough, she’s still tormented by Ian Desperaux’s constant intrusion into her thoughts and dreams. As Gwen struggles to balance her responsibility to the witches’ council and her secret relationship with her vampire boyfriend, Aiden, she’ll soon discover exactly what it means to be Deceived. He regarded me with a look I’d seen a few other times, an expression I tried to ignore, but at the moment, I couldn’t look away from. I was a woman who noticed attractive men, but I would never act on those feelings. I loved Aiden as sure as the night is long. But Dorian stirred something deep inside of me, and we connected on a level I hadn’t with Aiden. It wasn’t easy to ignore something that profound, especially when it was staring at me like I was the sexiest girl in the world. Dorian took a step forward. His arms hung limp, but I could tell he was nervous about what was happening between us. The tightness in his jaw and triceps betrayed the cool confidence he was trying to portray. An inch of icy air separated us. I lifted my eyes to his, and we stared at each other. No words were needed; our body language spoke for us. Dorian brought his arm up and with the back of his hand caressed the side of my face with more gentleness than I imagined. My eyes closed against the feel of it. A shuffle of feet enticed my eyes open just in time to see Dorian bending forward and toward my eager lips. You can stalk Stephanie on Facebook, and have access to updates on her upcoming books!